While on an after hours shoot for the Royal Gorge Bridge, I stood above the remains of the old Incline Railway that was destroyed by the 2013 wildfire. The sun had just set behind the mountains to the west, so the Royal Gorge was becoming very dark. 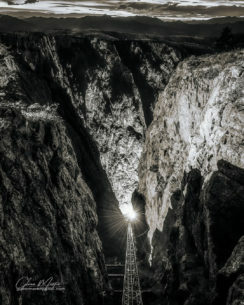 However, the train from the Royal Gorge Railway had just rolled to a stop at the bottom which made the light burst to illuminate the walls of the gorge and the slot where the incline rails still stand. It was quite an exhilarating moment!